When I was first introduced to the concept of Placeholders (PHs) for eTMF over four years ago, I was SO excited! We were in the process of performing TMF reviews for hundreds (yes, hundreds) of studies. I thought, “YES, FINALLY, some intelligent engineer has figured out a way to determine TMF completeness automatically! We don’t ALWAYS have to go back and try to piece together which documents should be present in the TMF!” I gushed to my colleagues how these PHs would magically make us more efficient and reduce our review times. 1. Correct set-up: I often compare PHs in an eTMF to file folders in the paper world. When you have paper, you set up a Table of Contents (hopefully based on the TMF Reference Model) to determine all the expected documents based on the type of study, phase, vendors, protocol type (e.g. adaptive studies…take heed, these are starting to dominate clinical trials…when ICH E8 is finalized we’ll have some additional guidance about how to properly manage these types of studies), etc. Understanding the study and which documents are expected to be filed should drive the set-up process, as it will enable you to “drag-and-drop” them into the correct placeholder when you get them. Like magic! 2. Continuous review: Once the eTMF is set-up and all the PHs (i.e. folders in the paper world) for the study are present in the eTMF, does that mean you’re finished? (Hint: NO.) How do you account for the unexpected events that occur on every study? (I managed clinical trials Phases I through IV for over 10 years, and I have YET to encounter a study that did not have an event occur…) This can be achieved by installing reminders for periodic review so that events are captured and reviewed as necessary. Events are tricky though, just because something unexpected happens, doesn’t mean that document(s) will be generated and need to be filed. Consistent and proper assessment of the PHs in the eTMF is required to ensure a robust eTMF. 3. Completeness metrics: Metrics is one of the best ways to evaluate TMF health. As a Co-Facilitator of the MCC TMF initiative, I cannot stress enough the importance of carefully scrutinized metrics! You must ALWAYS understand what is being measured and why. Additionally, it is important that you understand what the metrics are (and are not) telling you about the health of your TMF. The PH metrics may be an indicator of the overall quality of a document level (e.g. study), Functional Line (e.g. Data Management) or milestone (e.g. First Subject First Visit). Your consistent review of these metrics quantifies and qualifies TMF health. 4. Proper PH management and assessment: When the study is set-up incorrectly in the paper, you end up with empty file folders. (Do yourself a favor: Please DO NOT file notes-to-file (NTFs) in those sections in which they do not belong!) You may also encounter file folders that are not accounted for on the TMF TOC or even worse, documents that are filed in miscellaneous folders as they don’t “fit” into any other folder. When working with PHs it is essential to evaluate them on an ongoing basis to alleviate these problems. Unfortunately, and inevitably, you will discover PHs that represent a document that will never be collected. There is no such thing as a perfect TMF. Don’t stress yourself. Provide documentation of the due diligence and move on. To summarize, these four key processes will provide you with the proper organization of your eTMF for correct placement of documents, leading to inspection readiness. If you always keep in the back of your mind, the concept of a placeholder as a folder that needs filling, for completion- you will continually be mentally prompted to review your eTMF (auto-reminders don’t hurt either!). 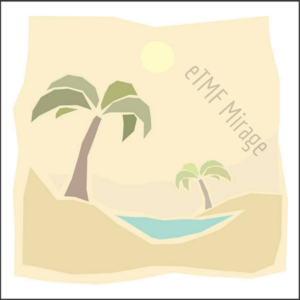 Placeholders are a useful tool in plotting the course for filing in an eTMF, but their presence alone only causes the “mirage” of completion. Your application of the processes to fill them will result in an oasis and lead to true inspection readiness. The placeholder is just one piece of the puzzle which will automate correctly filing the documents – just like the magic we anticipated four years ago. TMF experts from LMK will also be on-hand at the DIA Annual Meeting from June 19-22 in Chicago, IL at the company’s booth (#741) to discuss TMF quality, completeness and inspection readiness. Rich joined LMK in May 2016 with a wealth of knowledge gathered from a 20-year career in clinical research. Rich used that time to familiarize himself with the workings of clinical research organizations, by serving on multiple trials with varying clinical indications. Exposure to different work environments such as study startup, trial feasibility, safety surveillance, and patient enrollment, in addition to working with Trial Master Files (TMF), enabled Rich to build a solid grasp of regulations such as Good Clinical Practice (GCP). Rich solidified his knowledge of TMF by tracking and entry of documents and metadata, and used an ever-growing awareness of the TMF Reference Model to extend proficiency thereof. LMK Clinical Research Consulting, LLC (LMK), is a functional service provider of Trial Master File (TMF) consulting and services. LMK is a trusted leader for its dedication, quality solutions, and expert services in TMF. LMK is a woman-owned business certified by the Women’s Business Enterprise National Council. For more information about LMK, visit www.lmkclinicalresearch.com .